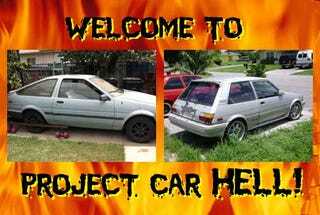 Project Car Hell, Screamin' Corolla Edition: AE86 or FX16? There was some grumbling over the choices in our last Choose Your Eternity challenge (which was won by the '77 Levis Edition AMC Hornet AMX by a healthy margin), ostensibly because they were too easy… but we know the real reason: being reminded of the Malaise Era brings up the uncomfortable parallels between the hard economic times then and those now. Of course, there are differences; sure, the current war is more expensive- in dollar terms- than was Vietnam, but inflation isn't the raging beast it was back then (though the bill for our 15-year debt binge looks to be just as painful as 20% inflation was). What we need is a flashback to Morning In America! The 80s, when the Evil Empire was crumbling and Toyota still built cars that didn't hit you like a triple Valium with cough syrup chaser; yes, it's Corolla Time! As we all know, the problem with Japanese PCH cars is that parts are too easy to find, the build quality is too high, and Japanese engineers- particularly those working for Nissan, Honda, and Toyota- tend to design them to be easy to work on. Where's the fun there? Send those guys to Europe for a crash course in complexity, then to Detroit for some lessons in bean-counter-driven corner-cutting! But it's still possible to get yourself an inexpensive Japanese project that scores pretty high on the Cool-O-Meter yet will drive you absolutely mad- you just need to find something fashionably fast-and-furious that's had years of dodgy mods and rod-bending abuse… like, say, this 1984 Toyota Corolla SR5 (go here if the ad disappears), which could be yours for an offer probably well below the $1,200 asking. I know what you're saying: why get the 8-valve SR5 when you could have a GT-S with the righteous 4AGE? Hey, this one "needs a piston ring," which is Craigslist-speak for "a terrible noise happens every time I try to start it," so you'll have the opportunity to build your own engine with all the valves and boost a suitcase full of money can buy! And hey, it already comes with the all-important "carbon fiber eyelids" (though you're on your own for the equally important carbon fiber shift knob). Watch the video above (shot from the Schumacher Taxi Service Corolla) and then try to muster up the usual "wrong-wheel-drive" quips! What you need is a Hell Project that, if when finished, will be a squirming, torque-steering, axle-snapping beast that will require luck as well as skill to keep under any semblance of control! Yes, we mean the AE82 CorollaGT-S, which came with plenty of howling 4A power to go with its weird sketched-by-an-8-year-old 80s-hatchback profile. They're not as easy to find as they once were, but we've spotted this '87 Corolla FX16 GT-S (go here if the ad disappears) with the same asking price as the AE86: $1,200. It has a 20-valve silvertop engine and some quasi-trick parts, but the seller states that the "motor has a blown head gasket which is not much to fix." Now, we often find that "blown head gasket" is Craigslist-ese for "smoke and/or chunks of metal pouring out the tailpipe and/or holes in the oilpan," but maybe that diagnosis is accurate- hey, stranger things have happened! Besides, the seller has a turbocharger "which we can probably work a deal on," so you can see what the logical next step would be.